Patrick Chambers is one of our favorite coaches, and also one of our favorite people on campus. Since coming to Penn State from Boston University in 2011, Chambers has been a relentless bundle of positive energy, not only (but especially) when he’s patrolling the sidelines for the Nittany Lion basketball team. 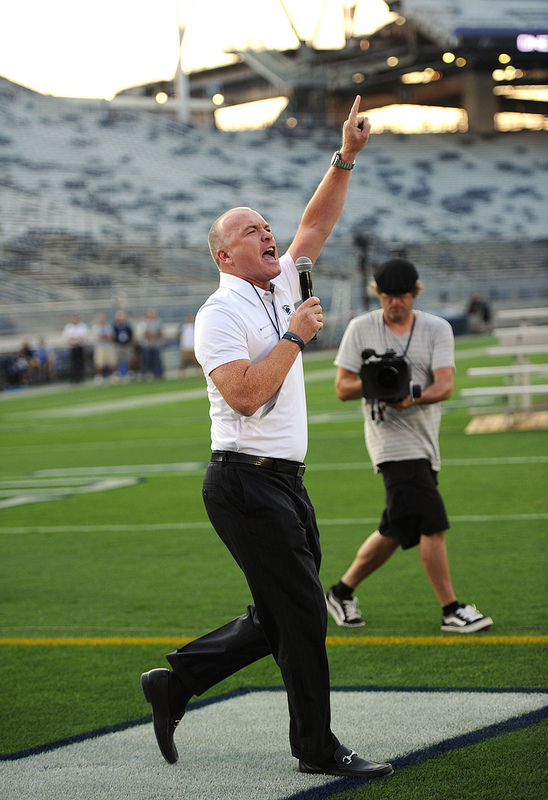 On Saturday, he begins his third season in charge when Penn State hosts Wagner at the BJC. Chambers’ trademark intensity and readily apparent coaching chops aside, we wanted to catch up with him here because of his connection to Penn State football. Beyond being a huge fan, he’s become particularly tight with Bill O’Brien; anyone who saw them share the stage on Coaches Caravan events the past two years can attest to how well they get along. With that in mind, we caught up with Chambers on the eve of the new season to talk football and hoops. TFL: You’ve talked about it before, but can you shed some light on your relationship with OB? Why do you think you guys hit it off so quickly? Chambers: We’ve definitely connected. Obviously we’re cut from a very similar cloth. We’re both Irish-Catholics, and I was baptized a Bostonian for two years, so that helps the cause. His older brother played against my brother at Penn. We’re both fathers, both head coaches, we’ve both done some amazing things, and we’ve both been at some difficult places. We can sit and talk about anything. 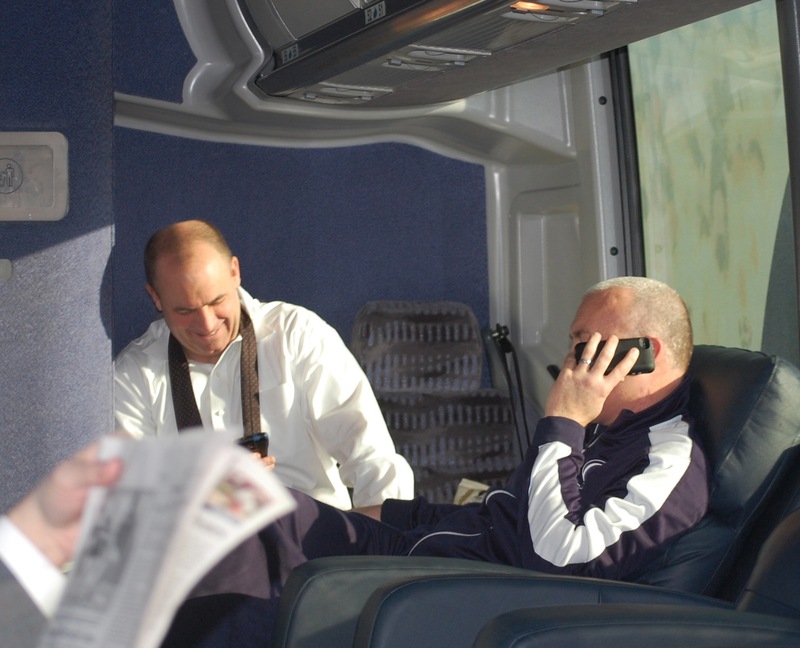 TFL: I had the chance to travel on the bus for the Coaches Caravan last year and again this past spring, and for anyone who saw you two at the actual events and wondered if it was an act—it wasn’t. You guys really seemed to enjoy that opportunity. Chambers: The Caravan was great. I thought we developed a lot of trust, just sitting in the back row there, four or five hours at a time, like two teenagers in the back of the bus, talking about our teams, talking about sports. TFL: As much as the two of you joke around and play off each other on stage, there’s more to it than that. There seems to be a real mutual respect there. Chambers: There’s great respect for one another. I think we understand what each other’s going through. We can support each other in the media, inside the locker room, or just sitting and meeting late at night, talking things through. It’s valuable to have a guy like that to bounce things off of. We talk about coaching philosophy, the ups and downs. He spoke to my team a few times last year, at a time when we desperately needed a new voice. Hopefully I have a chance to return that favor at some point. I’m there for him if he needs me. TFL: In some tangible ways, there seems to be a real connection between your programs now, as well. Chambers: He’s a big hoop fan. The fact that he comes to our games and sits in the stands, really gets on the refs, that helps us out (laughs). But he’s really opened up his doors for our program, which is huge for us going forward. He’s allowed us to come into Lasch Building and use their weight room, use Holuba Hall, use their film room, you name it. Our kids get to see what’s going on over there, see all the awards. And of course, Fitzy (strength coach Craig Fitzgerald) came over here and re-did our weight room, too. TFL: We might see some of the benefits of all that starting Saturday. I know you’re eager to see your guys back on the court. Right now, how are you feeling about your team? Chambers: I feel good. We’re a little banged up, we’ve had some scrimmages, and I think we’re progressing. Practices are brutal, guys going after each other, a high level of competition—that’s what you want to see. We’re right where we should be. Tim Frazier, DJ Newbill, Brandon Taylor, Ross Travis and Donovon Jack, those are probably our starters, and they’re coming and competing every day. I like our young guys, they’re trying to figure things out. Our transfers, same thing. But I like where we are, I like our mindset. It’s gotta be there every single day, and you don’t really see that until you face some adversity. TFL: Coming into your third season, you’ve recruited a lot of these guys, had a lot of time with the guys you inherited. Do you feel like this is “your” team now? Chambers: What you have to do is make them your guys. When I got to BU, I had nine seniors. How do you do that? You have countless hours of meetings, relationship building. You sit down with them constantly to build that relationship. I would say here, even my first year, even though we didn’t win a lot of games, we built some lasting relationships. Now, it’s Year Three. I feel like the veterans, they have a great understanding of what Penn State basketball is, and the Penn State way—”Attitude,” how hard you have to play, and what you’re up against. The veterans are teaching the transfers and the freshmen, and trust me, that’s an ongoing process. TFL: Last thing—I know a lot of our alumni are particularly excited about the “Return to Rec” game next month. I hear you guys have a great day planned. Chambers: Yeah, a little retro, a little throwback. We’re gonna honor the ’91 team, we have a lot of players and coaches coming back, and we play a great team in Princeton. It’s gonna be standing room only. If you haven’t gotten your ticket yet, you better get it. This entry was posted in Exclusives and tagged Bill O'Brien, Brandon Taylor, Craig Fitzgerald, DJ Newbill, Donovon Jack, Nittany Lion Basketball, Patrick Chambers, Rec Hall, Return to Rec, Ross Travis, Tim Frazier. Bookmark the permalink.